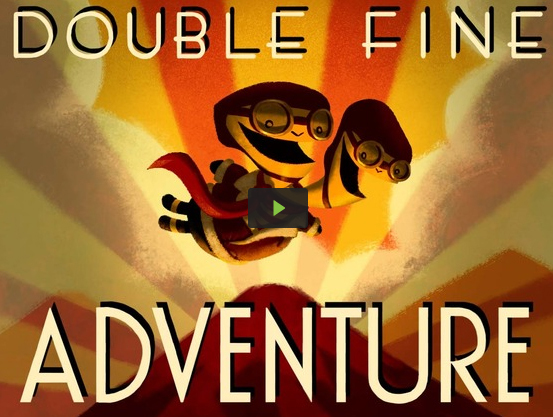 I first crafted a blog post nearly a month ago about the (then) new kickstarter page that Double Fine put up to gather $400,000 to help fund a new adventure game that harkened back to the adventure games of old. It's since caught wildfire and fans have come out in droves to show their support. The studio has collected over $2.5 million from over 72,000 backers of the project which has helped grow the project to a much bigger scale than they could of imagined. Initially, they planned on using the $300,000 ($100,000 was to go to the documentary team whom is filming the entire development process) to make a small, relatively pulled back title for the PC without any plans for spoken language, or multiple written languages... but Tim Schafer has come out and said that the extra money gathered has allowed them to confirm that the project will indeed have spoken dialogue, have it's text translated into a number of languages (French, Spanish, German and Italian) and be making it's way to Mac, Linux and some iOS/Android devices. Multiple rewards have also been added to the mix, with various pledge levels. The $100 pledge in particular includes a T-Shirt, Poster and the game in an old school PC title box (like those that Day of the Tentacle or Grim Fandango came in) with game and documentary on separate discs. Higher pledge levels gets you niftier gear for your generosity, but even the smallest $15 pledge will give you access to a copy of the game when it ships.